Republican legislators held a fundraiser this morning before the opening of the session. Jeff Kaufmann , the chairman of the Iowa Republican Party, said Republican Governor Kim Reynolds has a mandate from voters. “The governor won 88 of 99 counties. That is a statewide referendum, a pat on the back to go get ’em, period!” Kaufmann said to kick-off the event. “We need your continued support as we move into this legislative session,” Reynolds told the crowd. House Speaker Linda Upmeyer of Clear Lake has been the top Republican in the legislature for the past four years. “The voters affirmed what we were about, what we did and we’re excited to go forward,” Upmeyer said. The Iowa State Capitol as the 2019 Legislative session is ready to begin. 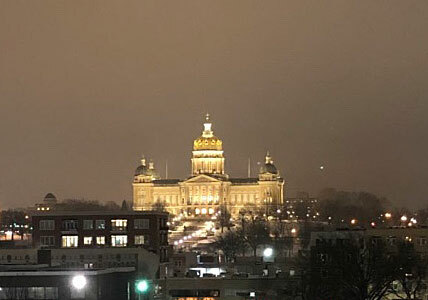 Senate President Charles Schneider, a Republican from West Des Moines, said Republicans aims to limit the size and scale of government and reduce the tax burden. Senate Majority Leader Jack Whitver, a Republican from Ankeny, said the GOP made “big reforms” over the past two years. 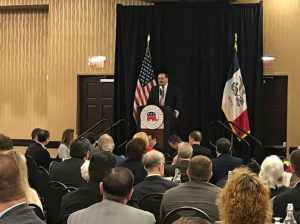 This morning’s event was a fundraiser for the Iowa Republican Party and it was open to the media. Iowa Democrats held a private fundraiser last night.